1. Add potatoes to a large pot of salted cold water and cook until they are tender. 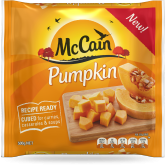 Add McCain Cubed Pumpkin and cook for a further 3 minutes or until McCain Cubed Pumpkin and potatoes are very tender. 2. Drain McCain Cubed Pumpkin and potatoes well and return to saucepan over low heat. Add butter and milk. Using a potato masher, mash the mixture and season to taste with salt and pepper. 3. Meanwhile, heat olive oil in a large saucepan over a high heat. Add onion, garlic, bacon, thyme and rosemary and cook for 3-5 minutes or until onion is tender and bacon is golden. Add beef mince, tomato paste, Worcestershire sauce and use fork to break up the mince. Allow to brown for approximately 5 minutes. 4. Sprinkle mixture with flour. 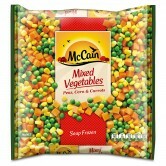 Add McCain Pea, Corn and Carrot Mix, beef stock and tomato passata. Stir well to combine and allow to simmer for 10 minutes or until mixture has thickened. 5. Preheat a fan-forced oven to 180°C. Carefully spoon beef and vegetable mixture into an 8 cup capacity oven proof dish and evenly top spoonfuls of pumpkin and potato mash. Use a fork to create peaks on the top of the mash – this will ensure it gets nice and crispy. Place the oven dish onto an oven tray to catch any of the gravy that may bubble over and place in the oven to cook for 40 minutes or until the top is golden and crunchy. 1 Add potatoes to a large pot of salted cold water and cook until they are tender. 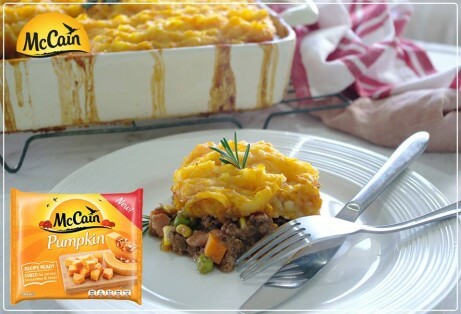 Add McCain Cubed Pumpkin and cook for a further 3 minutes or until McCain Cubed Pumpkin and potatoes are very tender. 2 Drain McCain Cubed Pumpkin and potatoes well and return to saucepan over low heat. Add butter and milk. Using a potato masher, mash the mixture and season to taste with salt and pepper. 3 Meanwhile, heat olive oil in a large saucepan over a high heat. Add onion, garlic, bacon, thyme and rosemary and cook for 3-5 minutes or until onion is tender and bacon is golden. Add beef mince, tomato paste, Worcestershire sauce and use fork to break up the mince. Allow to brown for approximately 5 minutes. 4 Sprinkle mixture with flour. Add McCain Pea, Corn and Carrot Mix, beef stock and tomato passata. Stir well to combine and allow to simmer for 10 minutes or until mixture has thickened. 5 Preheat a fan-forced oven to 180°C. Carefully spoon beef and vegetable mixture into an 8 cup capacity oven proof dish and evenly top spoonfuls of pumpkin and potato mash. Use a fork to create peaks on the top of the mash – this will ensure it gets nice and crispy. Place the oven dish onto an oven tray to catch any of the gravy that may bubble over and place in the oven to cook for 40 minutes or until the top is golden and crunchy.